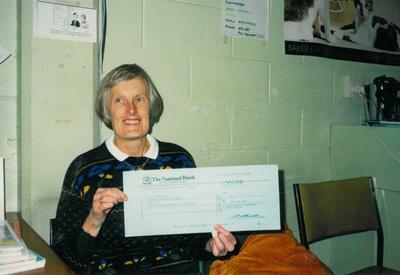 Miss Lesley Armstrong, District Librarian September 1973 to December 1994. The Library, too crowded, was moved once again. Were assured by Council - "It's just a temporary stall"
Like all politicians they promised the moon. It's got very cramped, very old, and threadbare. The Library still waited, it's turn hadn't come. Suddenly "The Library" was the Councillors' theme. Candidates promised to spend lots of notes. Than the little old warehouse that just couldn't cope. Workmen began measuring the ground. A brand new Library pleased everyone!